According to ABI Research, this year's Mobile World Congress proved the perfect springboard for showcasing virtual reality, so much so that the company is now predicting that 50 million headsets will be shipped globally every year by the end of the decade, including devices that work with a smartphone. The most basic virtual reality design, Google's Cardboard, has already hit 5 million orders and it's very simplicity - the fact that it can be used with an Android smartphone - is what really giving consumers a taste for VR. "Smartphones are the perfect platform for the VR market, because they already have the power and technological functionality necessary to create a fun, in-depth simulated environment," said ABI Research Analyst Eric Abbruzzese. This simplicity is creating a host of immersive opportunities and partnerships. 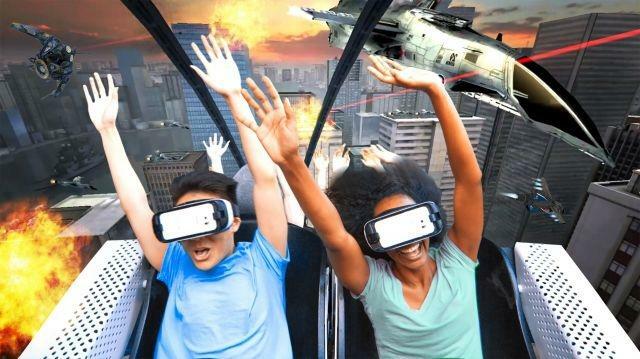 On Thursday, the US theme park Six Flags announced that it is working with Samsung to create Virtual Reality roller coasters. "[It] is certainly a new and thrilling proposition," said Marc Mathieu, chief marketing officer at Samsung Electronics America. "Now, people can be immersed into a totally new universe while riding a roller coaster." "This remarkable technology is a definite game-changer for theme park rides," added John Duffey, Six Flags President and CEO. The growing accessibility of headsets is drawing more firms into VR to examine its potential beyond gaming. "The VR content ecosystem is opening up to include casual and traditional VR gaming, as well as education experiences," said Sam Rosen, a ABI Research VP. "360-degree video also saw notable investment from Facebook and YouTube, pointing to another promising VR growth opportunity, while content developers are still learning how consumers engage with mobile-reliant VR systems." At the other extreme of the market, the Oculus Rift, PlayStation VR and the HTC Vive are all serious gaming headsets at serious price points that need to be connected to a computer or console to work. Despite the premium, demand is strong. For example, 15000 HTC Vive headsets, which cost $799 each, were snapped up within the first 10 minutes of pre-orders going live on February 29. However, one group of consumers that won't be getting a taste of premium VR gaming in the immediate future are Mac users. Speaking to Shacknews, Oculus VR's co-founder, Palmer Luckey said when asked why the Oculus Rift headset isn't Mac compatible that: "If they ever release a good computer, we will do it."